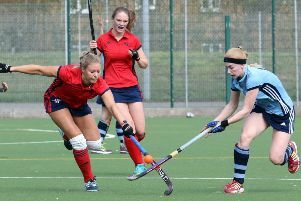 It had all looked so promising but Banbury’s South Premier Hockey League campaign has fizzled out. Banbury’s season ended with another disappointing performance as they slumped to a 4 -1 defeat on their visit to Tunbridge Wells that leaves them in sixth place in division one and outside of the National League promotion places. There was little to play for in the final game with both sides secure in their league places for next season but Banbury were able to see some promise for the future as Jamie Boardman marked his debut with a bright performance. The game seemed strangely subdued as neither side could make much headway until midway through the first half when Ben Allberry was able to complete a home side move to take the lead. Banbury increased their pace and levelled only five minutes later when Callum White finished a move started by Boardman after he collected a long pass and then delivered a cross into the circle. Despite stirring words from Banbury skipper Barney Williams at halftime the visitors were still unable to find the form that has eluded them in the closing stages of the season. They soon conceded a penalty corner early in the half for Sam George to restore the home side’s advantage. Banbury had not won a single penalty corner at all in the first half but were able to do so as they pushed forwards again in the second half but it was not to be as none could be converted. With frustration starting to cause disciplinary problems that reduced Banbury to ten players on two separate occasions they were unable to find an equaliser and conceded two very late goals as Ian Harvey and Connor Poulain stretched the home side’s lead. Manager Steve Brooker has seen a disappointing end to a season that promised so much only three weeks ago but was still able to find positives from the team’s improvement. He said: “Right now we are only thinking of the disappointment of missing out on promotion, but we have a made a strong return to South Premier One to finish in the second highest league position ever for the club. We know that we can beat all of the teams that will be staying in this league as we have done so at least once this season.